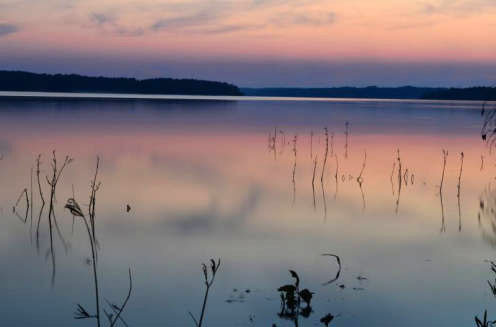 Falls Lake State Recreation Area is a collective of seven access areas scattered around the shoreline of an undeveloped, 12,000-acre reservoir. More than 300 campsites at four access areas offer a range of outdoor experiences from RV hookups to primitive tent camping and group camps. There are five swim beaches in the recreation area and a number of boating ramps, some reserved for paddlers and non-gasoline powered boats. The Beaverdam access offers a network of mountain biking trails as well as a separate and quiet lake impoundment perfect for paddling, fishing and swimming. The Mountains-to-Sea State Trail winds through parts of the recreation area and is a centerpiece of a network of hiking trails. North Carolina Division of Parks and Recreation. Falls Lake State Recreation Area. http://www.ncparks.gov/falls-lake-state-recreation-area (accessed September 19, 2015). Farr, Edward; North Carolina Division of Parks and Recreation. "Sunset at Sandling Beach." Photograph. North Carolina State Parks Collection, North Carolina Digital Collections. September 26, 2012. http://digital.ncdcr.gov/cdm/ref/collection/p16062coll27/id/131 (accessed September 19, 2015).